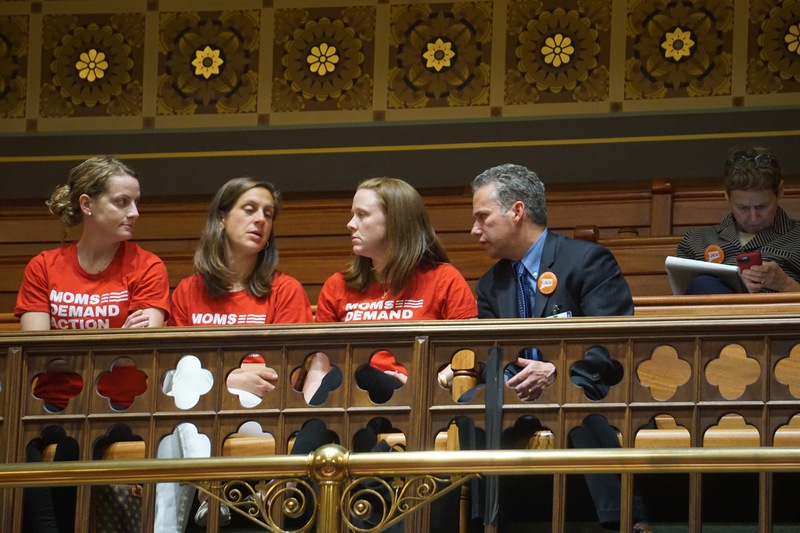 Jeremy Stein, executive director of CT Against Gun Violence, with members of Moms Demand Action during the Senate debate. The state Senate voted 26 to 10 Tuesday night for final passage of a bill that bans the sale and ownership of bump stocks in Connecticut, joining a growing number of states that have prohibited the rapid-fire rifle accessory used by the Las Vegas shooter who killed 58 people and injured hundreds last October. Legislators sent the measure to Gov. Dannel P. Malloy, who plans to sign it, after debating whether banning the devices without compensating owners was constitutional and if doing so would prevent gun violence. Bump stocks are not common and had not been part of the gun debate before Las Vegas. Massachusetts, California, Vermont, New Jersey, Washington and Florida already have enacted bans. The U.S. Justice Department proposed a federal regulation in March banning the devices. Malloy, a national voice for gun control since leading the state’s response to the shooting deaths of 26 children and educators at the Sandy Hook elementary school, applauded the bipartisan passage of the ban. Eight Republicans joined all 18 Democrats in favor; ten Republicans were opposed. Bump stocks allow semiautomatic rifles to fire at a rate similar to that of machine guns. The bill also would ban trigger cranks and other rate-of-fire enhancements. Sen. John Kissel, R-Enfield, proposed an amendment that would have allowed bump stock owners to keep their devices if they registered them with the Department of Emergency Services and Public Protection. It failed after three Republicans joined all Democrats in opposing it. Kissel said it concerned him when the state decides property rights can be trumped by a public interest it deems more important. “And I’m not saying the state can’t make that determination, but I also believe that, if nothing else, fundamental fairness dictates that the state owes these people compensation for what they have to destroy, remove from the state, or turn over to DESPP,” Kissel said. If the bill is signed into law, those who possess the devices after Oct. 1 will be guilty of a Class D felony. People who have a gun permit and possess a rate-of-fire enhancement device will be guilty only of a Class D misdemeanor on a first offense until July 1, 2019, and a Class D felony on a subsequent offense. 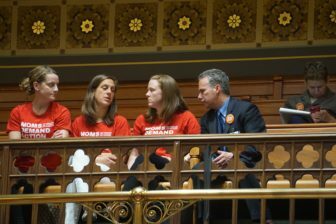 Jeremy Stein the executive director of Connecticut Against Gun Violence, said the bill was closing a loophole. “We can all sleep a little safer in Connecticut now that we’ve banned bump stocks,” he said. “Connecticut and the nation have banned machine guns and all this is, is banning what we’ve already decided we’re going to ban,” Stein said. Scott Wilson, president of Connecticut Citizens Defense League, the state’s largest gun group, said the ban would do nothing to make the state safer. The rapid rate of fire can be replicated by using belt loops and shoe strings and the ban merely prohibits a piece of plastic, he said. Under the bill, the commissioner of DESPP would need to provide written notification of the law on its website and to federally licensed firearm dealers. “Eighty-two percent of Americans support a ban on bump stocks. This is not some liberal approach, this is something the vast majority of folks in our country support … our people demanded action and I think we have listened,” said Sen. Beth Bye, D-West Hartford.